I had no intention of making a Halloween card today………………nope…………but some things just happen. Two days ago I was playing with the Color Burst Watercolors. All of the colors explode on the page when you add water which is fun, but the violet even more so. So I ended up with this wild background that was a bit too wild for what I had in mind at the time. 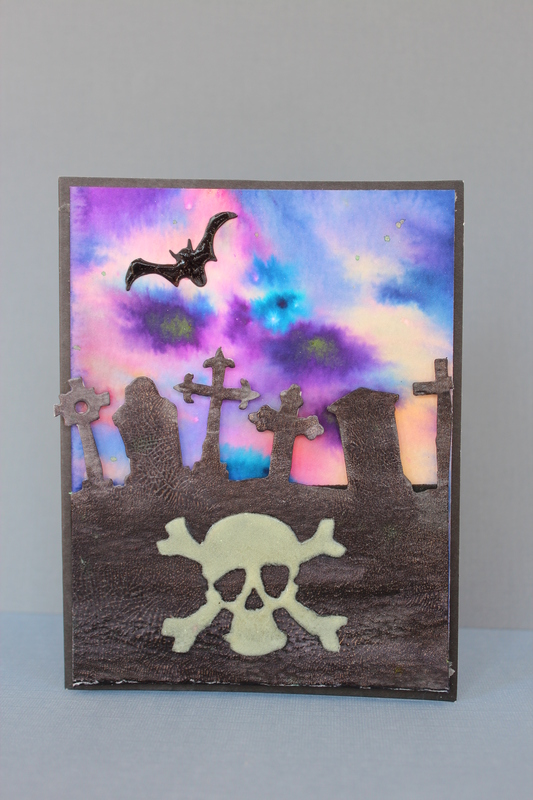 But the purple colour got me to thinking about Halloween, and when I think about Halloween I always think of Tim Holtz………….thinking about Tim Holtz got me to thinking about a Headstone die that I got super cheap on a close out sale but had never used. Not using something always makes me feel guilty for a nano second or so about all the stuff I have. So it was a perfect solution. Use that die with your purple background. No waste ……..no guilt. But wait……..there is more………….why not use that WOW Glow in the Dark embossing powder you bought and feel even less guilty. Perfect. My camera is still hanging his head in shame…………but at least you can see that the skeleton does indeed GLOW IN THE DARK. 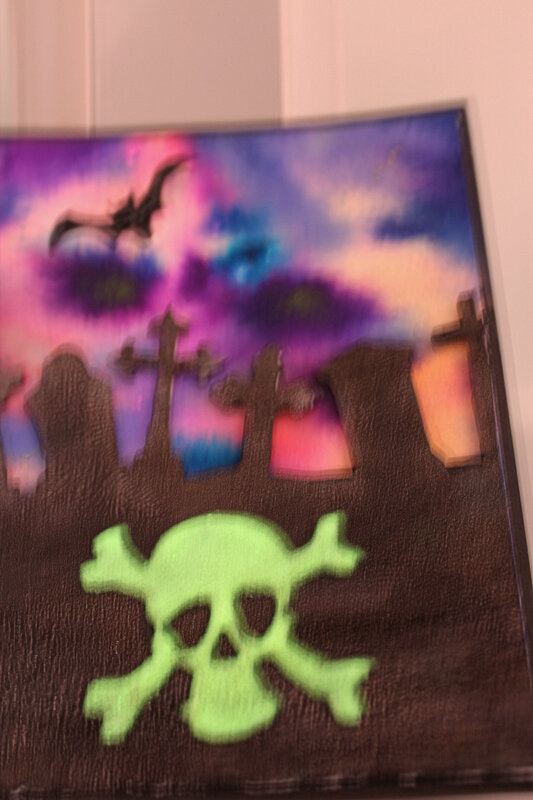 Supplies: Ken Oliver Color Burst, Tim Holtz Graveyard and Mini Bat and Skull Die, Wow Glow in the Dark Embossing powder, Kuretake Gansai Tambi black watercolor, Ranger Crackle Glossy accents, MME card base, Scotch foam tape, Creatology Fun Foam and Scor tape. Posted on October 2, 2015, in Card Samples, Oscar's (Deb's) Card Samples and tagged Color Burst, Tim Holtz, watercolour. Bookmark the permalink. 1 Comment.